Description: An eb intermodal follows on the heels of the Southwest Chief. As the tail end goes by, a wb will fly through. Description: Manifest freight enters the Big Canyon. Description: Long live the Santa Fe! 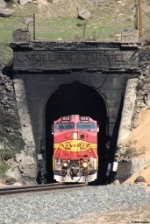 Description: The Laurel Spokane pops out of the tunnel. Title: No black fog today! Description: Just a trace of exhaust from the GE duo, but, they had help and a much lighter train, than say, a coal drag. Description: Empty K691 heads back to Cicero, with a warbonnet trailing. Thanks for the heads ups that enabled me to get this catch! You know who you are! Description: CSX S62015 heads south with some nice power. Description: CSX S62015 has some nice power for the trip south as it crosses the Richland Detector. Description: CSX S62015 heads south. Description: A former Santa Fe Super Fleet unit leads a train of autoracks and stacks past Union Jct. Description: BNSF 691 leading BNSF 626 at Daytons Bluff.